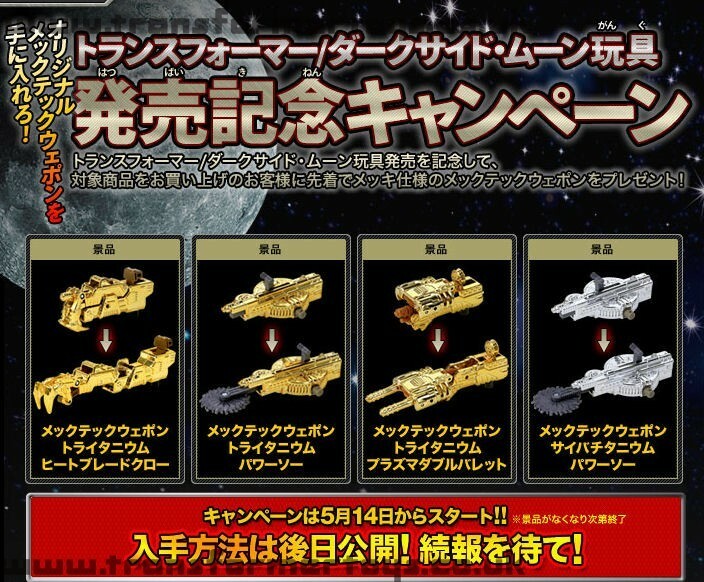 TakaraTomy have update their Transformers Dark Side of the Moon (Dark of the Moon) website with a new page dedicate to two MechTech prize campaigns.� The campaigns are the first Lucky Draw Transformers Dark of the Moon prize draws and starts on May 14th for with the Gold and Silver MechTech Weapons. These weapons will be made available as store exclusives, though the stores are yet to be named. The first campaign has four prizes, with the top prize being 10 gold chrome MechTech Dark of the Moon Bumblebee.� The 2nd prize is 10 double set of Transformers and Transformers Revenge on Blue-Ray, the third prize is 100 sets of the MechTech weapons with the fourth prize being a poster. The winners of the first campaign will then be entered into a second campaign, where 100 winners will go onto receive a gold chrome Transformers Dark of the Moon Optimus Prime. With TV Magazine seeming dropping their end of year gold chrome prize campaign, most Lucky Draws now are released as store prizes, like the recent Family Mart Transformers Animated campaigns, or as DVD tie-ins.� This tends to mean that the figures are produced in higher quantities and thus sell for a lower price on the 2nd hand collectors market.